The Cape Town water situation is still among the dominant news topics in South Africa as the current electricity crisis again puts the spotlight on the country and the economic implications of these crises. Climate change is real and we all need to prepare for fresh water shortages around the world. The water struggle is exacerbated in South Africa certainly by internal migration patterns and higher water usage in many industries due to increased economic output, but the lack of proper planning of the resources and timely responses to changing patterns are seen as the main culprit. The Cape Town water reserves have been replenished with good rains this spring time. The dams supplying Cape Town with water are about 70% full but now summer has arrived and thus the rains usually slow down in the Western Cape. 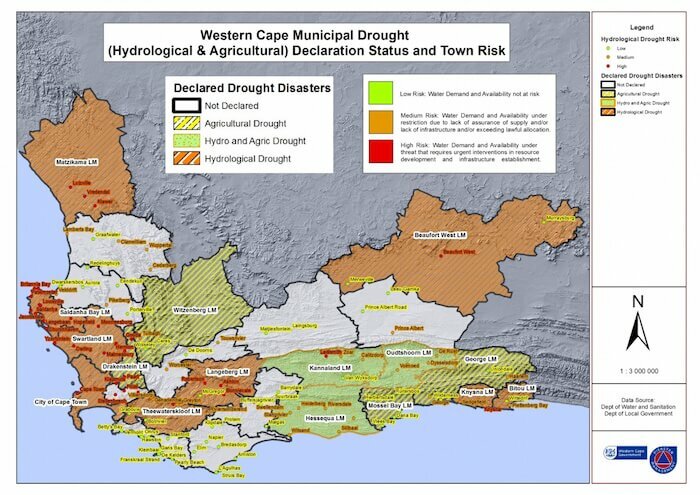 Some areas in the Western Cape, however, have extremely low dam levels as you can see in the map below. Although most Capetonians continue to save and restrict their water usage, we still have to be mindful about the precious resource. The Critical Water Shortages Disaster Plan that was announced earlier this year and the much dreaded Day Zero has moved out to 2019. Even though planned, the installation of more alternative water supply has been limited again, as the threat of water shortages seems not to be that urgent anymore. This, of course, has its own dangers. Water wastage rumours and the playing of political games - national elections are planned for 2019 - are unsettling and create unhappiness among many communities. We all know that in South Africa, many communities still struggle to make ends meet and don't have adequate water supply. The percentage of water usage in Cape Town's townships to the total water consumption is minimal, less than 5%! So the running taps in these areas certainly should not be of concern to us who so conveniently can still open our taps. Most people in the townships use about 20 litres per day, and they have to fetch their daily water. However, in a city that strives to be among the best in the world and one that attracts not only tourists but investors and innovators from all over, it is a real disaster that water restrictions to this extent impact daily life and businesses. However, with planning this situation can be handled quite efficiently. Did you know that water usage in most European countries is about 200 litres per person per day, while Americans are said to use about 370 litres per day! What is the standard calculation of water usage per household? The common Cape Town household is calculated to consist of 4 persons. As such all water bills are based on 4-person households and maximum limits will be exceeded when your household uses more than 12,600 litres of water (105x4x30) in the given month. From 1 December 2018, households will be allowed 12,600 litres of water per month. Cape Town Water: What to do if your household has more than 4 persons? If more than 4 persons live in your home, then apply at the City of Cape Town for an increase of your quota. You need to send through a motivation why you need a higher quota. Read more here. What happens if my household exceeds the maximum water usage? If water usage exceeds the maximum limit, heavy fines will apply. Water management devises will be also installed. How long will these water restrictions be in place? Even if we receive some rainfall over the next months, the restrictions - maybe at a lower level again - are here to stay. Of course this also depends on water usage and amount of rainwater received by the dams. The national government in fact rejected the city's plan to increase the allowance from October onwards, as they had insisted that dams need to be filled to 85% before restrictions would be lessened. Cape Town Water Crisis: What means Day Zero? The date for Day Zero is established by the mayor of the city of Cape Town together with her team of advisors. Dam levels of the dams supplying water to the city of Cape Town were drastically low and stood as low as 21%. 'Day Zero will come into effect when dam levels are at 13.5%'. This means water supply to most suburbs will be cut. Densely populated areas such as townships will stay connected, as will strategically critical areas such as hospitals and clinics. Please be aware that the date can move closer or further away, depending on water usage and rainfall. What will happen in 2019 if the water usage goal is not reached? 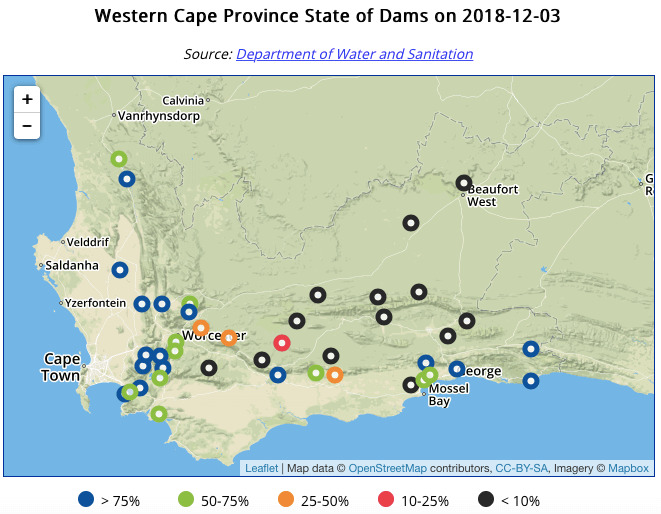 If there is no sufficient rain to increase dam levels and water usage is greater than expected, than the municipal water supply will be turned off for many suburbs and areas in and around Cape Town. Critical services and key commercial areas will be left on line so water can be supplied to upkeep essential services such as hospitals and main business centres. How far industrial areas around the city will keep their water running or will be cut off, has not been mentioned yet. When the taps have been turned off, there will be around 200 water collection points around the city that will be installed over the next weeks. Cape Town Water Crisis: Where can we get water once the taps run dry? There will be about 200 water collection sites with several taps per site throughout the city. There have been no announcement about specific sites yet. As per info on 1 February, the Disaster Risk Management Team is still labouring over essential questions such as: 'What range and size of containers will people choose to use? How will they carry these containers to and from the standpipe? What time of day will they come to the Collection Point? What transport will they opt to use to and from the Collection Point?' etc. More than 50 taps will be installed per Cape Town water site, so people can collect 25 litre per person per day. It is said that it will be possible to collect for up to four people per household and that drive-in facilities will be possible. The army and police force will be there to support collection procedures. There will be queues, so be prepared to wait or stand in line to collect your water. There is an example on their info, but I struggle to follow and understand the graphic. Try here: It's on page 32! What will businesses do when water is cut during the Cape Town Day Zero period? The Cape Town Chamber has published a survey regarding the impact of the drought to businesses in the wider Cape Town area. It is expected that some businesses will need to close with the water shortage and that some people will continue to work from home. However, only 60% of business are expected to continue as before, this will certainly impact our economy. Many businesses have made provisions already to support their employees with granting more flexible working hours and some employers might be able to provide additionally water to their employees due to existing boreholes on site. The Cape Town water crisis will be a major strain on the city's economy and if Day Zero happens, job losses will be unavoidable. Cape Town Water: Will schools close when the taps run dry? About half of all Cape Town schools have boreholes and as such access to water. However, about one quarter of these are in need of urgent repair and are these seem to be planned to be rectified until Day Zero. The responsibility for water access will be put to the school principals, school governing bodies as well as the Department of Education. The Western Cape Premier Helen Zille maintained that schools will stay open even if Day Zero should hit the city, however, it is unclear how this situation will be managed and also which actions private schools will take. It seems the management of the situation is in the hands of the respective schools and management teams to decide on which precautions and arrangements will be implemented. It's recommended to liaise with your school's parent association, school governing body or school management for further info. Cape Town Water Crisis: Can I still visit Cape Town or shall I postpone my visit? Of course, you must come and visit - and enjoy the Mother City! Cape Town needs tourists as the city benefits from the income of the tourism sector which accounts to roughly 10% of the GDP. Although some voices are heard that international events should be postponed, this would be detrimental to the city's economy, so all event organisers do their utmost to provided self-sufficient water solution, so the city's water reserves are not impacted further. Please come prepared and know that some local activities might be restricted due to the water shortages. If your company plans your transfer to South Africa, please consider that the restrictions will influence your experience. If you visit on an independent tour, you might also like to visit these other great places and explore South Africa further here. Cape Town Water Crisis: I already have booked a stay/business trip/visit in Cape Town, can I still come? If you have booked a tour or stay in Cape Town, your accommodation provider or tour operator surely will keep to your booking or in extreme cases will have made alternative arrangements, so your visit can go ahead as planned! Just be aware that not all swimming pools will be open and note that water restriction will also apply to you as a visitor. Cars at rental places for example might not be washed, shower times in B&Bs might be requested to be limited etc. 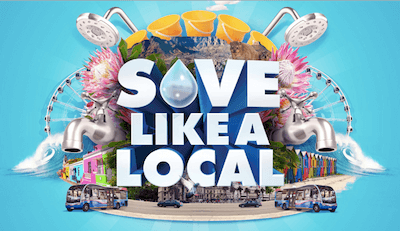 Cape Town Water Crisis: Save like a local and experience the city life through the eyes of locals. Surely an authentic experience will await you! Come prepared. Save with us and know that you still will be welcome. Hint: Pack enough clothes to change, so you do not need to wash your clothes on a short visit to Cape Town and bring wet wipes and hand sanitiser, so you can keep clean if there is no water. Disclaimer: All info provided above is from official sources available online as per 10 December 2018. Unfortunately, it is very difficult to find proper figures and get answers to many pressing questions from the city's official statements. Many of the available statements contradict each other even on official government sites which seem to be updated regularly. Also several pieces of information and maps have not been updated since last year, so a lot of speculation and misinformation is doing the rounds. We tried to follow up on various official resources and hope to give you a more comprehensive picture. Cape Town Water Saving Tips: Let's all keep saving our water to avoid Day Zero! Now what can we do to avoid a Day Zero period. If Day Zero will be declared, the period of the water cuts will probably last at least three month - again depending on rainfall during the rainy season that normally starts in April/May. Keep up your hygiene standards by using wet wipes and hand sanitizers instead of water. Hand shaking should be avoided. Continue your routine to visit health centres and keep your immunisations updated. If possible take immune boosters and increase vitamin intake and intake of probiotics. Cook it, peel it, grill it, fry it, steam it! - Kill bacteria and viruses when preparing your food! Use aerators on all your taps - this regulates and slows your water flow. Aerators are available at plumblink and builder warehouse, penny pinchers and many other builders' or plumbers' stores. Use your washing machine on a short cycle or only a rinse cycle, this usually suffices if your clothes are not stubbornly stained or extremely dirty. Use combo-shampoo & conditionner when washing your hair and keep your showers to under 1 minute. Use grey water for flushing or your garden. Wash your fruit and vegetable in a mild sanitising solution, such as Milton to keep of germs. Milton and other suitable detergents are available at your clicks, dischem, pharmacy or other local health store. Steam your food in little water or bake on baking paper or grill the food on foil in your oven or on your grill - now you have a great excuse to braai every day!